My friend and former mission companion Summer Bagley (now Carlile), "tagged" me. I don't usually play along but because I like her so much I thought I would be a good sport. "Tagged" works like this. You go into your pictures on your computer and choose the fourth picture from the fourth file. This picture was the result of that. 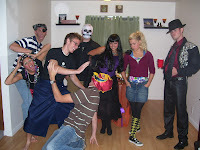 It was taken when we lived in Roy, UT and we hosted our first Halloween party. This was one of the pictures taken. We sure had a great time playing games and eating "scary" food. My personal favorite was the ice cream fondu balls. Can you see the Pirate McKay and gypsy Makana?